We think you can guess. 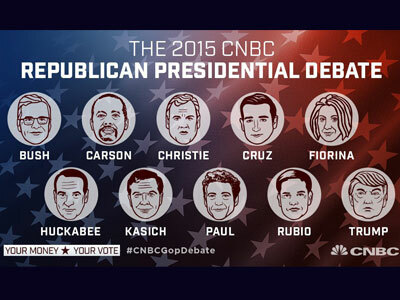 What’s CNBC’s GOP primary debate going to look like come next Wednesday at 8 p.m. ET? A lot like the last one, minus a dropped out Scott Walker. CNBC’s John Harwood, one of the three debate moderators, along with Becky Quick and Carl Quintanilla, announced the lineup today on Closing Bell. The major difference for the prime-time debate this time around is some slight musical podium action, with Marco Rubio flanking one side of Donald Trump (who shares center stage with Ben Carson) and Jeb Bush pushed a podium closer to the wings. Not a matter of concern, according to presidential historian Mark K. Updegrove, who still thinks Bush is the likely GOP nominee because small-c conservatism of the non-Canadian variety. The undercard debate will feature the same quartet as last time, with Lindsay Graham just making it under the wire. What we find most surprising about the announcement is that it isn’t splashed obscenely all over CNBC.com. We appreciate the restraint.